The Airbus A350 XWB that flew into Newark Liberty International Airport this week on another stop on its tour of the Americas looked awfully pretty parked out on the ramp by Signature Aviation Services. But like many of us gals in the prep stage of a special event, one should not look too closely or the hairclips and Spanx might be visible. That's because this plane MSN #2, just one of two prototypes with a full cabin configuration, is still running a variety of tests. Is the cabin too humid? How are the structure and seals handling the 6,000 foot cabin pressurization? Below the mood-lit, 252-seat extra wide-body cabin, (XWB, get it?) four tons of test and computer equipment is humming in the front cargo bay. Parked at the head of the coach section, engineers pay attention to a fancy array of monitors displaying the information collected from all the probes and sensors distributed throughout the plane. Another screen displays the data from the cockpit, flight controls and the effect of pilot actions on the cabin. "We are the bosses," Jaime Angoloti one of the flight test engineers told me, motioning to flight test engineer Bruno Bigande who I'd met in the cockpit and convinced to show me all around the airplane. "They operate, but the test is managed from the back,"
"They can watch, but we fly," Brigande replied. In early July, MSN #2 started its tour in Sao Paulo and Campinas Brazil, then conducted some high-altitude auto land testing in the Andes, flew on to Bogota and Atlanta before arriving in Newark. Next stop, Chicago before making a special fly-by and landing at the EAA AirVenture at Oshkosh. With Boeing's Dreamliners flying for 4 years and more than 1000 sold, it's hard not to make comparisons with this, the 787's chief competitor with 780 on order. 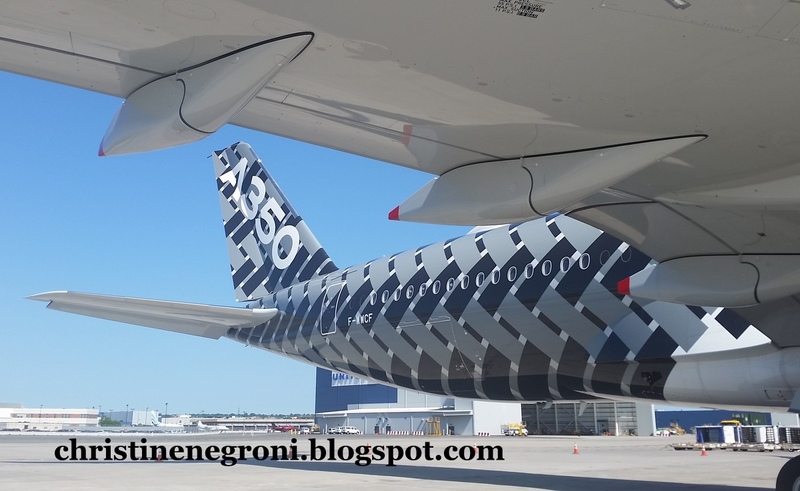 Like the Dreamliner, the A350 is half composite material, which Airbus makes abundantly clear with its carbon fiber-themed livery on the A350's hind quarters. While Boeing's 787 boasts a 20% improvement in fuel efficiency, the A350 is promising 25%. 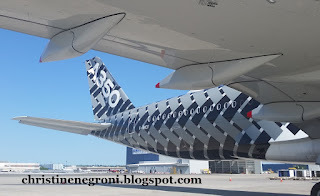 The A350 has opened up the view too with a sizeable improvement in the size and placement of windows, though the Dreamliner still wins the prize for the biggest and best windows for those of us whose prefered inflight entertainment is the view through the glass. 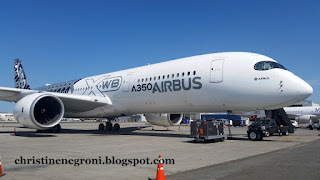 After visiting the plane today, I had a lunch and a debrief with aviation writer Jeff Wise and we discussed how Airbus seems to have benefited from not being first in the long-range, mid-sized widebody market. 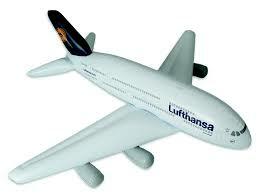 The world's airlines are clamoring for this kind of plane. It is bad news for the Queen-sized ladies of the sky, both the Airbus A380 and the yes-I'm-gonna-say-it ICONIC Boeing 747. But its a brand new day for flying. If that makes you feel sentimental, check out Patrick Smith's most recent Ask the Pilot post in which he poses the question, what flights changed the world. The answers might surprise you.